Imagine rounding the corner into a town surrounded by rolling hills, hardwood and pine forests where, at the vista, you see a sparkling body of freshwater. 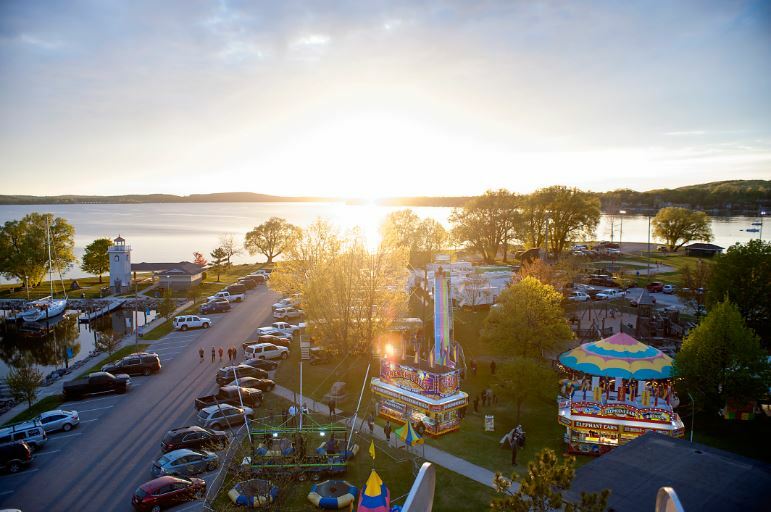 As you make your way down Water Street, you see a Post Office from the early 1900s, preserved historic buildings filled with thriving small businesses, bustling sidewalks, public art on the corners and straight ahead is glistening Lake Charlevoix. “Where Life Meets Lake,” Boyne City Main Street’s tagline, represents not only the sense that is created when strolling through the authentic downtown but a way of life. In fact, Lake Charlevoix was voted the second best beach for sunset watching by USA Today. And there is more – the Boyne River meanders through the heart of town, anchored by Old City Park and enjoyed by kayakers, canoeists and fishermen. Boyne City is an exceptional small town, with the activities and sophistication of a much larger destination. In Boyne City, there is a refreshing spirit that embraces the past while welcoming the framework for the future. Enjoy the Historic Walking Tour audio app while strolling through town visiting the shops, enjoying the art, taking in the historic architecture and visiting with the welcoming townspeople. Boyne will exceed your expectations! Welcome to Boyne City! We are so glad you are here.